At the First Battle of Panipat, on 21 April 1526, Zahir-ud-din Muhammad Babur founded the Mughal Dynasty. He was absorbed in the ethos of Persian culture, even through he was a Turkic-Mongol, descending from Genghis Khan on his mother’s side. 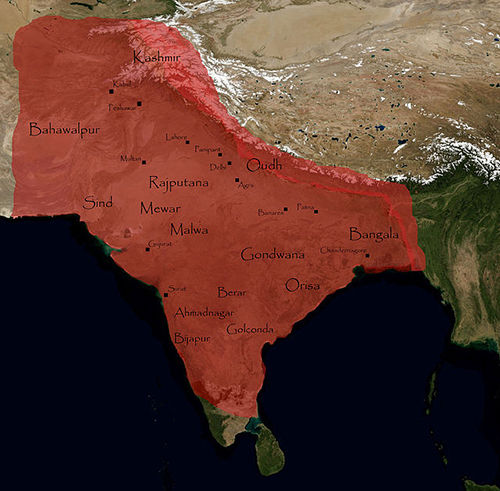 However, instead of repressing different cultures under its domain, the Mughal Empire accommodated them and collaborated with different ruling elites such as the Marathas, Rajputs, and Sikhs. This created relative peace and economic expansion during the 16th Century. The Mughal Empire reached its peak in 1700 with their sixth emperor, Aurangzeb, a pious Muslim. Men’s turban ornaments were called Sarpech, “sar” meaning head front; “pech” for screw. They were given to the elite as gifts from the Emperor and inserted into the side of a turban. 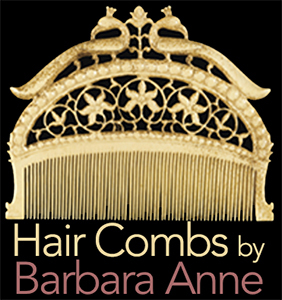 A turban’s jeweled plumes indicated royal status. The most popular motif was a large flowering plant. 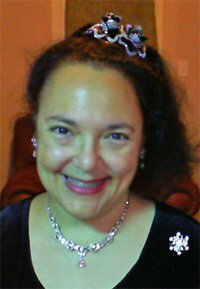 It could be found on everything from textile wall-hangings to jewelry. In addition, 17th Century ornaments had only one upward projecting unit. 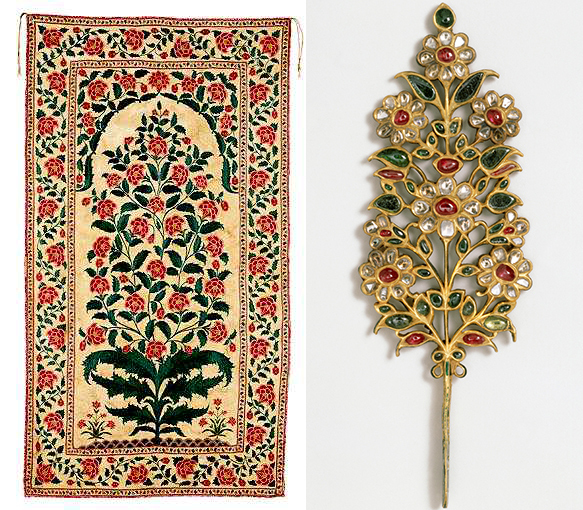 Here are some other magnificent examples of 18th Century single-plume turban ornaments from Jaipur in the Victoria and Albert Museum. 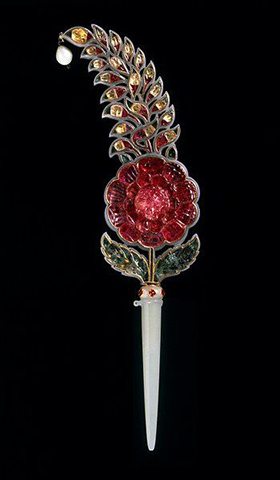 This sarpech is made of nephrite jade, gold inset with rubies, emeralds, topaz, gold foil, rock crystal and pearl. c. 1700-1750. 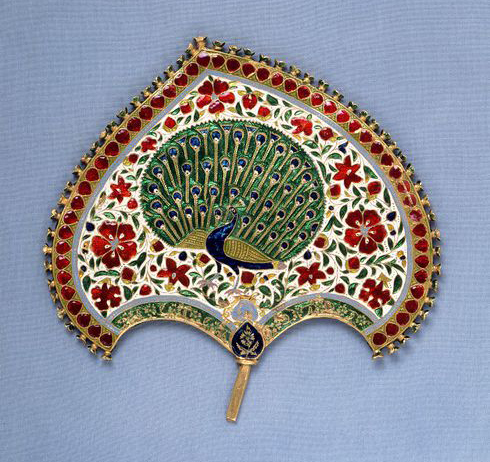 This gold and enamel sarpech was made by court jewelers c. 1700. In West Bengal, a pair of jewels were made for the male turban. They were worn in the center instead of the side. In 1755, the pair was presented as a gift to Admiral Charles Watson by Nawab Mir Ja’far, whom he installed after the Battle of Plassey because Ja’far would not threaten the interests of the British East India Company. 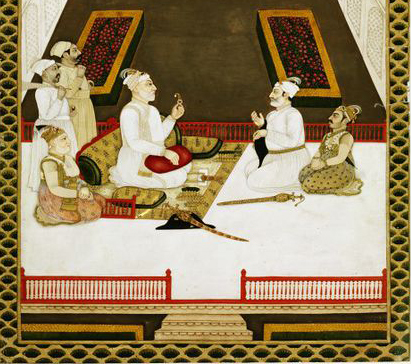 From Murshidabad, India, a district of West Bengal, this painting depicts Nawab Alivardi Khan seated on a terrace in conversation with his nephews Nawaziah Muhammad Khan (Shahamat Jang) and Sa’id Ahmad Khan (Saulat Jang) and his grandson Siraj ud-daula, all wearing plumes in their turbans. It was made of opaque watercolor and gold on paper, c. 1750. 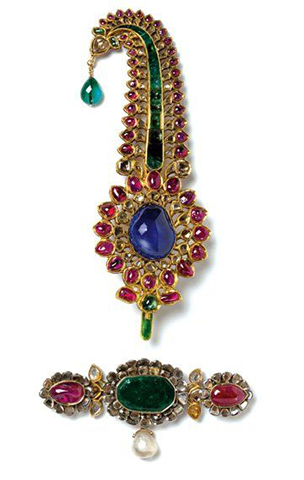 Finally, this magnificent sarpech was made from enameled gold in the royal workshops of Jaipur c. 1800-1850. 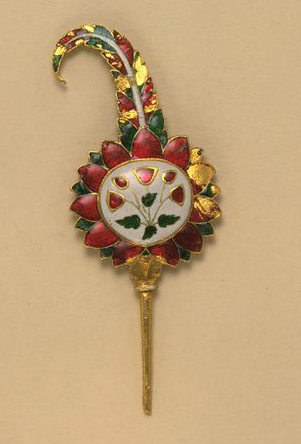 Given that the Hindu deity Krishna is associated with the peacock, the ornament might have been made to adorn an image of Krishna, rather than for a ruler to wear. Paintings of Krishna also depict him wearing ornaments in this form. The last Mughal emperor, Bahadur Shah II, was deposed by the British and exiled to Burma following India’s First War of Independence in 1857. The British government then assumed formal control of the country.